Ascend Dance Collective announces their upcoming performance of “Ascension” on Saturday, April 28th, 2018 at 7:30 p.m. at The Forum of Cypress Creek Christian Community Center, 6823 Cypresswood Drive, Spring, TX 77379. The April 28th concert will feature four pieces by Co-Director Donna K. Frogge. The first of these pieces, “Babel”, was choreographed for eight dancers and is set to the music of Ken Ray Wilemon. The movement for “Babel” was inspired by the story of the Tower of Babel; an ancient story which speaks to the development of different languages in the world. “O’er the Field” is a rollicking piece by Frogge which features music by the Kansas City, Missouri Celtic rock band, The Elders. Performed as a quartet, “O’er the Field” will open the concert with high energy, precision and fun. Frogge will also present a work entitled “Home Grown” which was inspired by her Arkansas upbringing. This stereotypical and humorous look at hillbillies is presented in three sections and is performed to the music of Flatt & Scruggs. And finally, Ms. Frogge will showcase her Modern I class (ages 9-12) from the Texas Academy of Dance Arts in a piece entitled “Firedance” with music by Peter Buffett. Co-Director Nicola Bennett will debut “Fluid Play,” a new work derived from happenstance. This piece will be presented at the April concert in two out of three sections and explores how our bodies organize and interact with various dance elements such as space, time, effort and relationship when picked at random and in no specific order. The music will also be a variable in “Fluid Play” as the specific song(s) will be chosen from a curated list just prior to the start of the evening’s performance. Three members of the collective collaborated to create “Ascension,” a new piece based on the Harvey flooding which incorporates narrative, poetry and prayer written and recorded by those who lived through the devastation. But the piece also attempts to show how they “rose above” the destruction to find peace and balance during such unsettling circumstances. 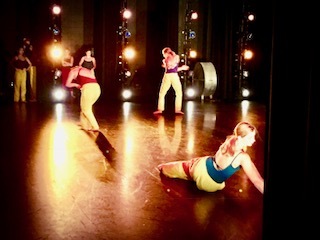 With choreography by Co-Directors Donna K. Frogge and Nicola Bennett, along with member Mirannda Lindberg-Clark, “Ascension” incorporates drumming, narrative and movement to create a truly unique and inspiring composition. The concert will also present diverse works by company members Mirannda Lindberg-Clark, Amy Spencer and Christine Chin. Ms. Lindberg-Clark will present “Dreamtime Nightmare,” a duet that interconnects two women and their hearts. Juxtaposing innocence with sensuality, the dancers move around each other as a unit bringing to life a merry-go-round effect on stage. Ms. Spencer will premiere a solo, entitled “Let There Be Light” performed by dancer Abigail Linden. With music by Tracey Chattaway, the sole use of hand-held lights during this solo portrays how our own “light” and life can shine as an example to others. Spencer will also present, “God is Great,” a group piece performed to the music of Axiom of Choice and based on the designs of Islamic art and the symbolic geometry that connects to God. Ms. Chin’s choreography, “This Woman’s Work,” is a contemporary group piece about the women in her life who demonstrated strength in spite of continued hardship and struggles. A portion of the proceeds from “Ascension” will go to support Cypress Creek Christian Church and Community Center’s rebuilding efforts after Harvey. Tickets are available at the door, $18 for adults, $10 for ages 12 and under. For more information visit www.ascenddance.org. “Ascension” is supported in part by Dance Source Houston’s Production Grant Program, and by sponsorships from Texas Academy of Dance Arts, Strike LLC, Drake Plastics Ltd. Co. and Basel’s Gymnastics.